A Denver man reported missing at Breckenridge Ski Resort Thursday, Jan. 12, at about 5 p.m. was found unresponsive by ski patrol the next day and pronounced dead later that morning. Sean Haberthier, 47, died of a severe skull fracture after skiing into a tree on the expert Lower Boneyard run off the Peak 8 6-Chair. Summit County Coroner Regan Wood reported he was not wearing a helmet at the time of the injury. The Summit County Sheriff’s Office assisted Breckenridge Ski Patrol with what the resort called an extensive search early Friday, eventually locating Haberthier at approximately 8:30 a.m. Coroner’s office staff responded to a call to the ski resort at 9:45 a.m., where they declared him deceased. “Breckenridge Ski Resort, Breckenridge Ski Patrol and the entire Vail Resorts family extend our deepest sympathy and support to our guest’s family and friends,” John Buhler, vice president and COO of Breckenridge’s ski area, offered in a written statement. Haberthier grew up in Powell, Wyoming, population 6,000 in the northeastern part of the state 30 minutes from Cody. High school friend and neighbor Paul Faxon recalled memories of racing motorcycles together, and weekend ski trips to Sleeping Giant Ski Area near the entrance of Yellowstone National Park and Red Lodge Mountain in Montana about an hour over the state line. After graduating from Powell High School in 1987 as a standout state-level wrestler, Haberthier moved to Colorado with his brother Tony in the early-’90s to start a construction business. Their parents, Stan and Dinah, soon joined the two boys in Denver. Following his father passing away in 2010, Haberthier is survived by his mother, brother and sister Debra. Haberthier’s death marks the second in the county this ski season — both at Breckenridge — after Longmont resident Kevin Pitts, 48, collided with a tree on Dec. 19 off the expert Alpine Alley run between the T-Bar and the Imperial Express SuperChair, also on Peak 8. 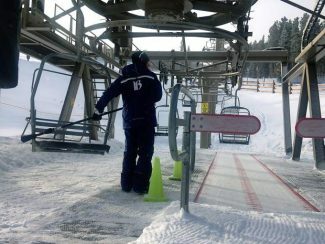 It’s the state’s third fatality on a ski hill for 2016-17 after 40-year-old San Antonian Kelly Huber plunged to her death off a chairlift at Ski Granby Ranch due to what was later determined a mechanical malfunction. Huber’s two daughters, 12 and 9, fell 25 feet from the Quickdraw Express lift as well, but both survived. Nine people died while skiing or snowboarding in Colorado last season, six of which occurred in Summit County. According to the National Ski Areas Association, a Lakewood, Colorado-based trade group representing the country’s resort owners and operators, there were 39 total fatalities nationwide during the 2015-16 ski year. Four of those six Summit fatalities last year took place at Breckenridge, including the final three of the season — all in the month of April. The six in the county matched the same total during the 2013-14 season, and topped the four from 2014-15.